EAST LANSING, MI – Michigan Institutions participating in the Cultivate Michigan campaign reported spending nearly $3.5 million on Michigan-grown or Michigan-produced foods from January 2014 to June 2016, according to a new brief published by the Michigan State University Center for Regional Food Systems (CRFS). These institutions include K-12 schools, early childhood programs, hospitals and health care systems, colleges and universities, long-term care facilities and other entities with a food service program. The Cultivate Michigan campaign asks institutions to commit to the Michigan Good Food Charter goal of purchasing 20% Michigan foods by 2020 and provides tools and resources to support participating institutions in sourcing food locally and tracking progress. The campaign is managed by the Michigan Farm to Institution Network (MFIN) which seeks to help farm to institution programs grow. Co-led by the Ecology Center and CRFS with support from MSU Extension, MFIN has over 400 members including institutional food service buyers, farmers, food vendors and distributors, advocates, and eaters. To date, 53 institutions across the state have signed up to participate, collectively serving nearly 135,000 meals every day. More than half of participating institutions (31) are schools and school districts and about 20% are hospitals and health care systems. Taking schools and districts together with early childhood programs, more than two-thirds of participating institutions serve children. "At Beaumont Hospital Royal Oak we have had great success working with the Cultivate Michigan Campaign and the Michigan Farm to Institution Network," said Maureen Husek, MFIN Advisory Board Member and Director, Nutrition and Retail Services at Beaumont Hospital - Royal Oak. "Prior to MIFN, we had been working to increase our local food purchases but encountered many barriers such as access to farmers and the sheer volume of product we needed." "The connections that we have made through MIFN and the materials provided through Cultivate Michigan not only helped us to increase our local buying, but also to promote our Michigan products to our patients and retail customers. More and more our customers want to see local food items on our menus and we are happy to provide this service. We use the Cultivate Michigan materials to educate them on our wonderful Michigan produce and the farmers who grow it for us. Due to our short growing season in Michigan, most recently I have been focused on extending our season with frozen, canned, and dried products. One of my favorite milestones was being able to serve Michigan blueberries year-round. For us that represents 24 flats/week for fresh, 300 lb./week for frozen, and 5-20 lb. cases/week of dried blueberries." Each year, the Cultivate Michigan campaign features four different Michigan foods, one for each season. These featured foods have proven to be a popular way to engage institutions in local sourcing, whether they are just beginning farm to institution programs or already have years of experience. They have also been a great way to connect with food suppliers and agricultural commodity groups and open up the conversation on how to provide institutions with the forms and quantities they need. Using these featured foods, institutions participating in Cultivate Michigan were able to source substantial amounts of Michigan food – including in total nearly 97% of milk, 57% of apples and 36% of blueberries served at these institutions. "There are a lot of institutions that are enthusiastic about buying more Michigan food – the number of Michigan institutions participating in Cultivate Michigan has more than doubled in our second year of the campaign," said Kathryn Colasanti, Specialist at CRFS and Chair of the Michigan Farm to Institution Network Impacts and Research Subcommittee, "And we know that the campaign is only capturing a fraction of the spending on Michigan food actually occurring, since food service directors and buyers have such limited time for reporting. As we move forward in the campaign, we hope to not only engage more institutions but also to work directly with more distributors to obtain purchasing records on behalf of Cultivate Michigan institutions, allowing us to get a fuller picture of spending on Michigan foods." 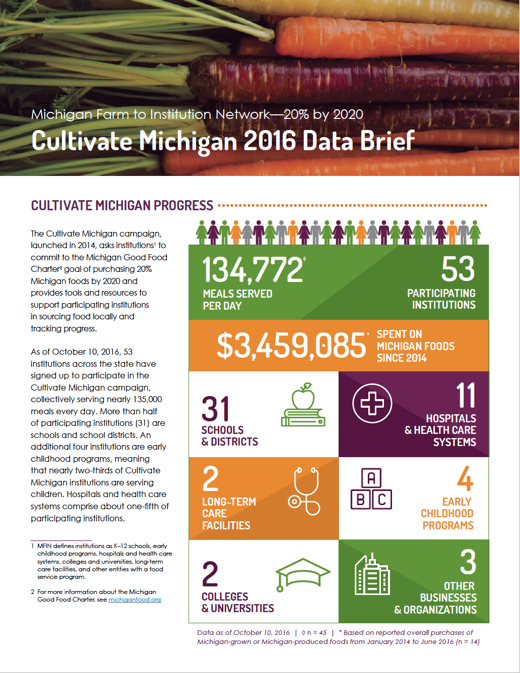 Find more statistics about institutional purchasing of Michigan food, which institutions are participating, and how Cultivate Michigan works in the newly published Cultivate Michigan 2016 Data Brief at http://foodsystems.msu.edu/resources/cultivate-michigan-2016-data-brief. For more information about the Michigan Farm to Institution Network, visit www.mifarmtoinstitution.org or contact info@cultivatemichigan.org. The Michigan State University Center for Regional Food Systems (CRFS) engages the people of Michigan, the United States and the world in developing regionally integrated sustainable food systems. CRFS extends MSU's pioneering legacy of applied research, education and outreach by catalyzing collaboration and fostering innovation among the diverse range of people, processes and places involved in regional food systems. Our vision is a thriving economy, equity and sustainability for Michigan, the country and the planet through food systems rooted in local regions and centered on Good Food: food that is healthy, green, fair and affordable. Learn more at http://foodsystems.msu.edu and connect on Twitter and Facebook: @MSUCRFS. Ecology Center is a non-profit environmental advocacy organization established in 1970 in Ann Arbor, Michigan. The Ecology Center develops innovative solutions for healthy people and a healthy planet in four primary areas: Environmental Health, Sustainable Food, Energy & Climate Change, and Zero Waste. This work is accomplished through educating consumers to help keep their families healthy and safe, pushing corporations to use clean energy, make safe products, and provide healthy food, providing people with innovative services that promote healthy people and a healthy planet and working with policymakers to establish laws that protect communities and the environment. For more information visit http://www.ecocenter.org/ and follow @Ecology_Center.